Our Employment History Verifications are conducted by licensed, highly trained, industry leading professionals. We conduct verifications by speaking directly with Human Resources departments comparing the details of your candidate's resume with the information Human Resources has on file. All verifications are comprehensive and focus on positions held, eligibility for rehire, employment dates, reason for leaving and confirmation of supervisor’s identity from the official employee record. 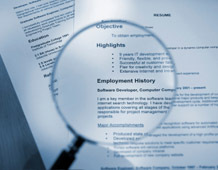 Why Request Employment History Verifications?